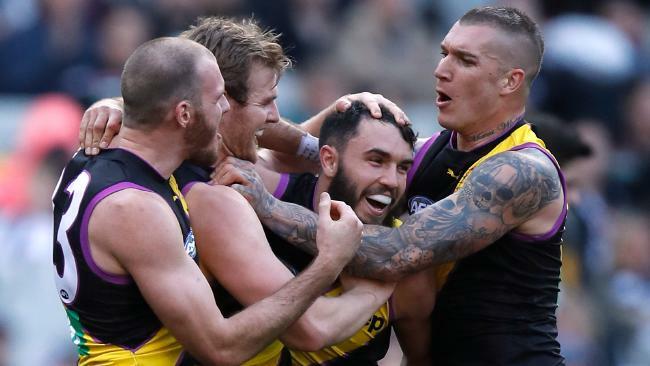 FORM says they just win, the betting confirms it and many neutral observers believe it's a September formality, but history says Richmond is far from over the line for back-to-back flags. And that's despite their current quote of just $2.25 (Collingwood is next at $7) being the shortest since the Magpies dominated the 2011 season only to lose their most important game. The side they lost to - Geelong - has been there too, three years earlier when a $1.65 favourite before losing the unlosable grand final to Hawthorn in 2008. The Geelong players from that game, 11 of whom played in three premiership sides in that era, still say the pain of defeat looms far larger in memory than the joy of victory. Cameron Mooney, who played in Geelong's 2007 and 2009 premiership sides and the losing 2008 team, watched Richmond play last Friday night. "I was at North Melbourne in 1998 and they were the best team all year but not the best team on grand final day, sometimes you can just go into a final winning but covering up some cracks," Mooney said. "The problem for Richmond's opposition is they've had some really close games, unlike us in 2008 when we were steamrolling teams and maybe missing little things that can creep into your game. "Richmond is getting so much learning out of their close games meaning it will take someone extremely special on the day to beat them. "Defensively, I haven't seen a team move their pieces across the ground better than Richmond in my time in football. "Who can beat them? I would have said GWS but injuries seem to have caught up with them, but they are the only team who can run with the ball and be brave with it. Geelong on their absolute best day, maybe." One sobering statistic for the Tigers, possibly, is this: Richmond ranks last among all clubs for clearances. Geelong’s loss to Hawthorn in 2008 came as a shock. Over the past 20 seasons, Champion Data shows no premier has finished lower than 13th for clearance differential - last year the Tigers were 11th. 2008: Geelong lost one game in the home and away season and finished with a whopping percentage of 161.84 per cent. They won their first two finals by 58 and 29 points before being upset by Hawthorn (26 points) in the Grand Final. 2009: St Kilda lost two games during the year, boasting a percentage of 155.71 per cent after they gave up just 1411 points for the year under Ross Lyon's strangulation game plan. They won two finals before losing to Geelong in the big one by 12 points. The Saints were well backed to win the 2009 premiership. 2011: Collingwood was clearly the best home and away side, losing just two games and recording a massive 167.66 per cent as they went on a scoring rampage. But come the big one they lost by 38 points to Geelong.